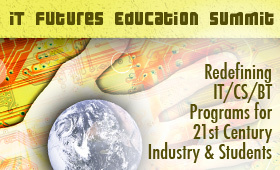 The 2013 IT Futures Summit at Microsoft has been cancelled. Instead on Friday, June 7th, the Center is hosting the Pathways to IT Applied Baccalaureate Degrees for WA State Students Summit (see here for details and registration information). If you want specifics, please contact Maureen Majury at maureen.majury@bellevuecollege.edu. Hopefully, we will be able to hold it again in 2014. We know our faculty and educators look forward to this event and have enjoyed attending the last eight years. The PowerPoint presentations and video from the 2012 Summit are available for viewing and downloading. 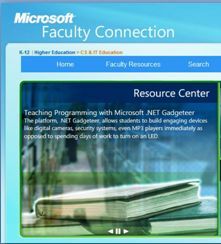 The Washington State IT Futures Education Summit holds its annual one-day event free event at the Microsoft Corporate Conference Center, (directions to the Center, Building 33), Redmond Washington. Join our technical and workforce development instructors and K-12 educators across our state in discovering new and innovative ways to improve IT education. This event features Microsoft speakers presenting on the new Microsoft initiatives, innovations, and products and subsequently the impacts, challenges, growth, demands of technology as it relates to education.